While a regular refrigerator is a must have in every home, a mini one is one of those underrated appliances, especially for those who like to have company over every now and then but runs out of fridge space for the party food and freezer space for the ice and frozen desserts. Our guide to finding the best mini fridge with freezer picks four good models that are perfect not just for party use, but also for dorm rooms and campers. While we have already narrowed down the field of good mini fridges to use for dorm rooms, offices, parties and tailgating, those did not come with proper freezers. Instead, the cooling space provided inside the main compartment is only enough to keep cold items semi-frozen for a few hours. They can’t freeze water for ice cubes or prevent ice cream from going soft overnight because the lowest temperature in the freezer box barely gets lower than 32°F or 0°C. If you only need to keep a lot of bottles and cans cool, you can get better value out of a dedicated beverage cooler or kegerator or even a wine cooler, as they have more space for your drinks. If you have a mini fridge with separate freezer that goes down to at least 5°F, everything, including a small batch of frozen meat will stay frozen. A separate thermostat allows you to regulate just this compartment in the unit. This is especially important for food safety practices. This double door unit gives the appearance of a full-sized refrigerator in a miniature size. This black 3.1 cu. ft. compact refrigerator and freezer combo by Midea is also available in stainless steel and is perfect for holding a variety of items. The refrigerator itself has storage shelves, drawers, and wired storage to store items between 32 and 50 degrees Fahrenheit. The freezer itself can be adjusted to temperatures ranging from -11.2 degrees to 5 degrees Fahrenheit. This mini refrigerator and freezer comes with reversible doors and the legs can be adjustable to ensure a level stand on any flooring surface. It measures 19.37″ x 18.5″ x 32.95″ inches. Customers appreciate this product because it is extremely quiet during operation. Both the refrigerator and freezer work well at keeping items cold and to an appropriate temperature. Another great feature of this unit is the shelving. The shelves specifically are a great size for the area and easy to move around. Owners are able to remove shelves they do not need or insert them at any time. In addition to two glass shelves, there is also a fruit and veggie drawer, and the fridge door has a can dispenser, a tall bottle shelf and another short shelf. Some customers report being unhappy with the size of the ice tray. The tray itself is quite small and does not hold much. Additionally, the can storage wire in the door can be difficult to maneuver. This unit comes with a warranty that covers the entire product for one year, and an extended 2-year warranty covering the unit’s compressor. The 3.1-cu. ft. compact refrigerator and freezer by EdgeStar is an energy star rated product that is easy to maintain and convenient to use. This product has a true-zero degree freezer and ample storage to keep all you items fresh and cold. This unit has stainless steel doors that can be mounted to swing out on either side. The 1 glass shelf, 1 wire shelf, and two vegetable drawers that lie one behind the other can be removed to make more room or for easier cleaning. Although the refrigerator area has an automatic defrost system, the freezer is manual manual defrost. You get an ice scraper to hasten the process. An ice cube tray is also included. This compact refrigerator with freezer holds a temperature ranging between 34-and-60-degrees Fahrenheit. The freezer area holds a true-zero temperature. This unit is equipped with an adjustable thermostat that allows users to set their preferred temperature. The refrigerator door has two half shelves of can dispensers, one tall half shelf for 2L bottles and one half shelf for cans. The freezer door also has an inbuilt shelf. The lighting system inside of the unit makes it easy to find items. Customers choose it due to its quality and durable performance. This small stand alone refrigerator and freezer unit is compact at 33.5″ H x 18.75″ W x 19.75″ D , and works flawlessly as it should. Some owners have found that cold beverages can become too cold in this unit, but that is not generally a major issue. The compact unit is extremely easy to use and fit into tight locations. As with other models, customers do not specifically like the wire design to store drinks inside of the door. Other than that, this unit operates with minimal noise, proving to be a highly reliable option. 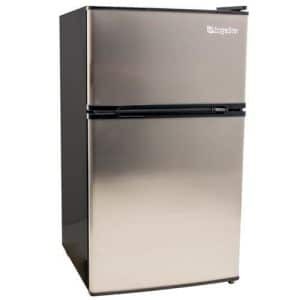 This energy efficient fridge/freezer by EdgeStar comes with a 90-day labor warranty and a 1-year warranty on parts. This 3.2-cu. ft. unit by RCA-Igloo has a 2-door design in a white finish. There is also a choice of black finish. The top door opens for freezer access where the bottom door provides convenient access to the refrigerator area. The flush-back was designed with space-saving in mind. This unit comes equipped with an adjustable thermostat and compressor cooler to ensure items inside stay colder in even some of the harshest heat. The unit measures 20 x 22 x 34 inches. The door of the refrigerator section has a can dispenser and a shelf for 2 litre bottles. The main section has pull out glass shelves and even a vegetable crisper drawer. The freezer is large and can hold a small standing 500 ml bottle and a frozen pizza or several frozen lunches. There is a shelf in the door of the freezer too. Customers report being extremely happy with how quiet this unit is. The size is perfect for a small office space, dorm room, or areas with limited space. The freezer works extremely well at holding a 0-degree Fahrenheit temperature. Some customers were not happy with the wire holder in the door for beverages, but it does work as intended. The slide out shelving ensures owners have additional space when needed. The refrigerator is equipped with shelving to hold small items as well as a full 2-liter size bottle. This RCA-Igloo unit comes with a 1-year warranty that covers all parts and labor. The Black+Decker compact fridge and freezer combo unit is the least expensive option on this list. This is also the smallest unit coming in at just 1.7-cu. ft. This unit comes equipped with a full-width freezer compartment with an ice cube tray. An adjustable thermostat control ensures the temperature settings are perfect for both cold products below and frozen products in the separate freezer section. You can make ice cubes in it and store half a pint of ice cream. The refrigerator section contains one full width removable and adjustable glass tray, and the door has one full width and one half width shelf so that you can accommodate tall bottles as well as soda cans. This unit is a space saving option, equipped with a flat back design and leveling legs to ensure a level fit in any space. The door is reversible, so you can mount it as you need to gain access from your desired location. The measurements are 18″ tall by 17.5″ wide by 18″ deep. Customers appreciate how lightweight this unit is and how easy it is to move around. The refrigerator and freezer combo fit perfectly under desks and tables, making it an exceptional choice for offices. The unit is quite small when compared to the other models, so the storage is limited. As a supplemental unit, this is perfect for any area. This product comes with a 1-year product warranty on parts and labor and a warranty for 2-years on the compressor.